Black Bart Wanted 11x17 Poster - Charles E. Bolton, aka: Black Bart, Charles E. Boles, T.Z. Spalding (1830-1917?) - Born in Jefferson County, New York in 1830, Bolton made his way to California in about 1850. 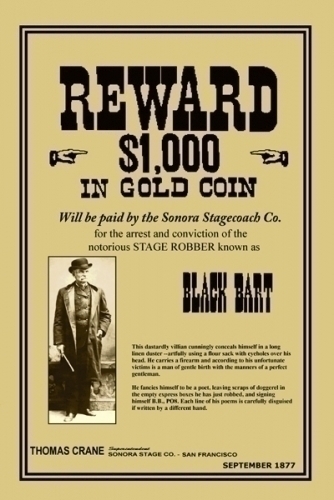 Sometime later he decided to make his living as one of most unusual stagecoach robbers in American history. His first recorded robbery was in August, 1877 when he waylaid a Wells Fargo coach outside Fort Ross, taking a strongbox that contained $300. Over the next years, he would rob another 30 stagecoaches, never wounding anyone during the crimes, and often leaving notes of poetry behind in the strongboxes he looted. Like a poster -- only smaller! Our high quality one page prints are printed on semi-glossy, 12 48 lb. paper and measure 11" x 17". Made right here in Missouri, USA!